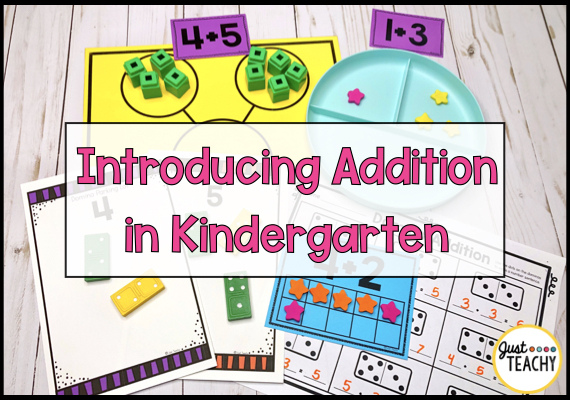 Introducing addition is always such a fun time in Kindergarten! The kids are so excited to get to use everything they’ve been learning about numbers, and it makes them feel like big kids! We always start with real objects and everything is hands-on with manipulatives before we transition into numerical representations. I want my students to have a good grasp on what it means to add things together before we move on to abstract adding with numbers and symbols. While introducing addition to my Kindergarteners, we will use a variety of activities and differentiated worksheets. 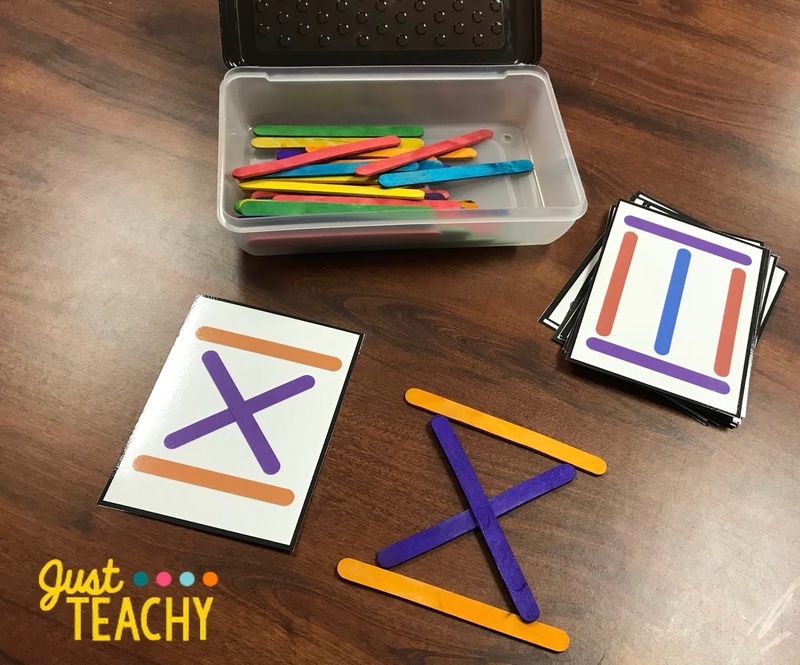 I made these manipulative mats many years ago, but they are still so much fun for the students to act out different addition stories. I also like to have the students act out addition problems. We do this with, and without, a large number bond on the floor. We'll also use stuffed animals to demonstrate the problems. After acting out addition problems whole group with a number bond, I give the students their own copy of a number bond, and we use manipulatives to work on these at their tables. While the students are working on these at their tables, I have my own number bond so I can demonstrate the problems as I walk around the room. I taped mine onto a cookie sheet so I can use magnets as my manipulatives and they won't slide around! The number bonds could also be used in a center along with these addition cards. I found these awesome divided plates at Target that the students can use like number bonds. (They are very sturdy, so they'll hold up for a while!) I put a set of addition cards, mini erasers, and the plates together in a tub, and we have an easy Math Center! Another Math Center the students can use to practice their skills are these ten-frame cards. They will just choose a card, and then use the mini erasers to demonstrate the addition problem. These domino parking lots are also a fun Math Center. Students choose a domino, add up the dots, and place it on the correct parking lot. After lots of practice with hands-on manipulatives, we move on to writing on paper. We also like to add with dominos! 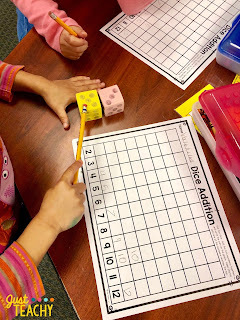 The students grab a domino out of the bucket, and then draw the dots on their paper. They then write the addition sentence and find the sum. 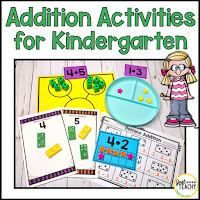 All of these activities and more can be found in my new "Addition Activities and Worksheets for Kindergarten" packet on Teachers Pay Teachers. I kept this packet free of any holiday or seasonal theme so you can use it any time of the year! 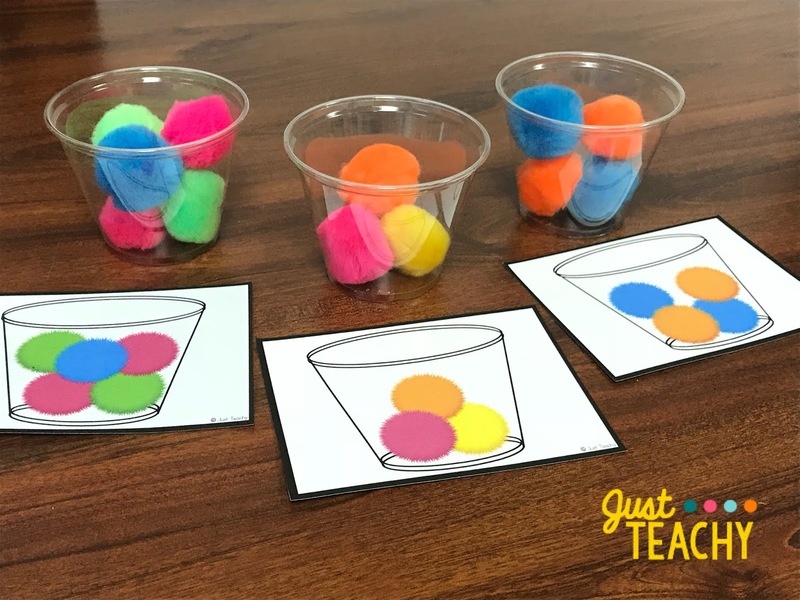 When selecting manipulatives to use with these activities, it’s up to you! I like to switch up the manipulative I provide for the students to use, but some ideas would be unifix cubes, beans, seasonal mini erasers, pom poms, buttons, etc. 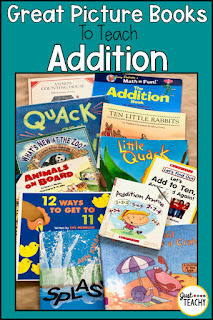 These are some of the books I read to my class while we are learning about addition. 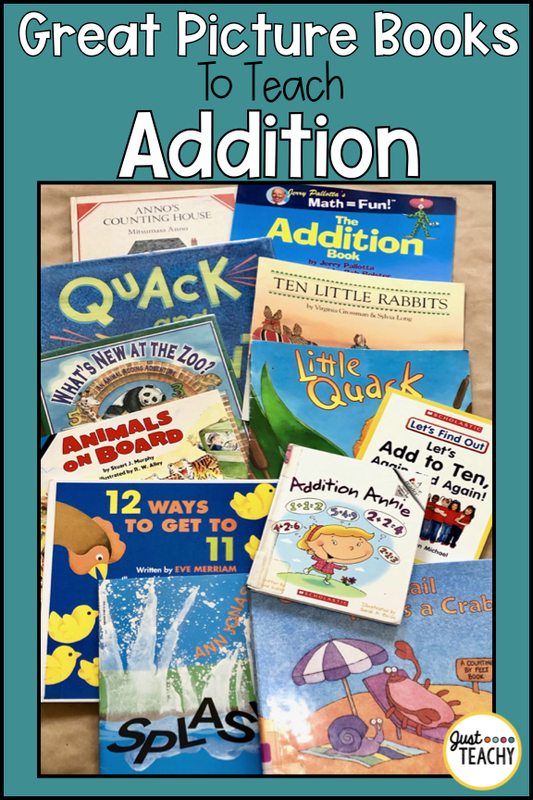 Some of these books do not explicitly write out addition problems, but are a great opportunity for the teacher to demonstrate the possible addition problems presented throughout the stories! Feel free to PIN this picture to come back to the list later! Time for open-ended play is one of the greatest gifts we can give children, and there is no better way to increase their creativity. When children are given toys to play with that have an expected finished product, their creativity is limited. This is not to say that there is no place for these types of toys in a child's education, but with loose parts, a child's creativity has no limits. And the best part is that there is no age limit! As a child grows and learns, they can use the same loose parts in completely different ways that are appropriate for their developmental stage! Another great reason to use Loose Parts is that they are such an easy way to incorporate open-ended play into a child's day. Loose Parts can included items such as rocks, buttons, shells, yarn, beads, etc. Children can use these items to create patterns, pictures, play scenes, and pretty much anything else they can imagine! "As long as materials can be moved, redesigned, put together, and taken apart in a variety of ways, they are classified as loose parts." Nicholson also states in his theory of loose parts that, "In any environment, both the degree of inventiveness and creativity, and the possibility of discovery, are directly proportional to the number and kind of variables in it." In my classroom, the students have opportunities for Loose Parts Play at the light table and also in our sensory bins, but I'm also adding a few more options this year. 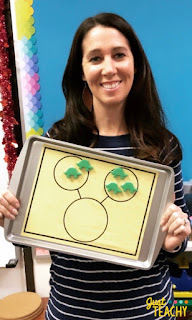 I added these cork trivets from IKEA, and the students have loved creating faces and different patterns using the trivets as a base. 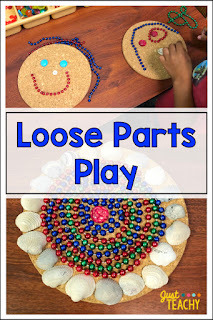 Do you use Loose Parts in your classroom? If a parent or teacher were to ask me right now which one book I could recommend that would rock their world, I know exactly what I would recommend! It's actually two books that I just cannot keep to myself! 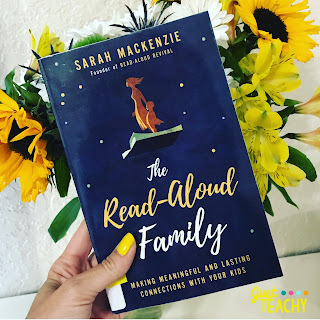 They are both on the subject of read-alouds and are perfect for parents, teachers, or anyone who knows and loves kids! 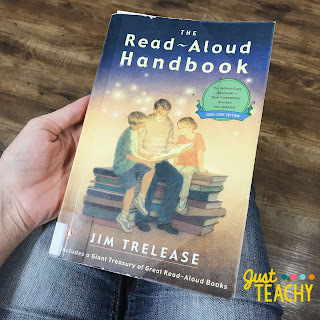 The Read-Aloud Family is a very easy read and directed more towards parents. This is the one I read first, but since she referenced The Read-Aoud Handbook so many times, I knew I had to read that one also! I devoured both of these books as quickly as I could while soaking up all of the great information and taking pages and pages of notes! In the back of both books, each author gives a list of recommended read-aloud books. The quality time you spend with children is the most important thing in the world! These were just a few jewels of wisdom from these two books, and like I said, I can't recommend these enough! So do yourself a favor, and grab one, or both, of them! I'll leave affiliate links here for both if you would like to order them from Amazon. I'd love to hear what you thought! 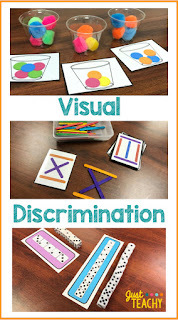 One of the biggest skills that I believe Pre-K and Kindergarten students can benefit from the most is Visual Discrimination. 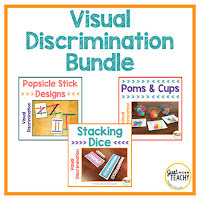 Visual discrimination skills enable children to be able to identify color, shape, size, orientation, and position, and are vital in the success of our students. These skills not only help with reading and writing, but also with social interactions such as reading facial expressions and body language. Paying attention to detail is an important part of developing good visual discrimination skills. So I created a few activities to use in my classroom, to work on this. 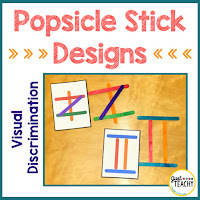 In this Popsicle Stick Design activity, students will need to pay attention to the color, orientation and position of the popsicle sticks on the cards to be able to recreate the design with real popsicle sticks. 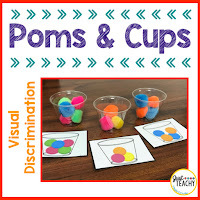 With the Poms & Cups activity, students are looking at picture of a cup filled with different colored poms and having to recreate what they see using the real poms and cups. I like to also add some tongs or tweezers for the students to use to transfer the poms, so they are also working on those fine motor skills! 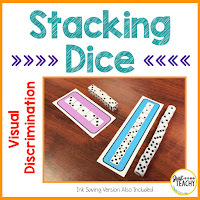 In the Stacking Dice activity, students look at the pattern of dice on the card and then recreate by stacking the real dice. 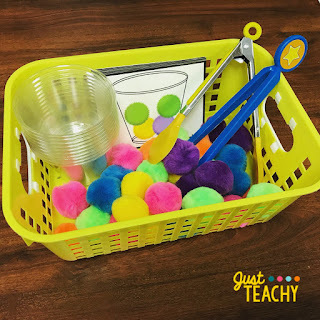 Each of these activities is available in my Teachers Pay Teachers store by clicking on the pictures below. I also have all three of these activities bundled together at a discounted price. Like these ideas? Go ahead and PIN IT! One of the best things I started in my classroom was teaching about Growth Mindset. My students are really loving it, and I'm loving hearing them using what they've learned in their conversations with their friends. (Just today, I overheard one of my students tell another, "I'm making progress.")!!!!!!! Basically, students with a Growth Mindset believe that their talents can be developed through hard work. They don't believe their abilities are set in stone, and are therefore more likely to achieve greater goals than students with a fixed mindset. 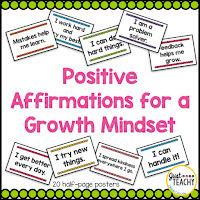 Right now, my growth mindset lessons consist of me introducing our positive affirmation of the the week, and reading a book that demonstrates that affirmation. After the book and a short discussion, we make a circle on the carpet. I ask a question pertaining to themselves and the affirmation, and then we take turns answering the question around the circle. For example after reading the book Whistle for Willie to go along with the affirmation, "I work hard and try my best", I asked the students, "What is something you can work hard on today?" We review the affirmation throughout the day, and only have one per week so we can really concentrate on it. I have all of the affirmations I want to use hole punched and bound with ribbon so I can just flip to the one I want to use and hang it up to display. These half-page posters with all of the affirmations I use can be found in my Teachers Pay Teachers store. Of course as I find new amazing books, I will be adding them to my lessons, but for now, here is a list of all of the affirmations and accompanying books I am currently using in my classroom. "I have the power to choose." I also shrunk all of my Positive Affirmation posters to mini-size, and I tape the affirmation we are learning that week to the top of this little mirror. We then pass it around the circle and each child repeats the affirmation as they look at themselves in the mirror. Want to find this page again later? Go ahead and PIN it!! Hi! 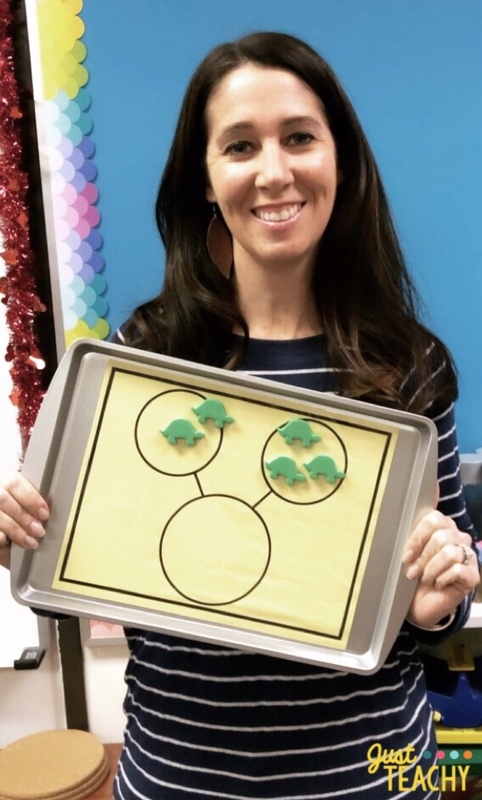 I'm Megan and I teach Kindergarten in the great state of Texas! I have taught 12 years of Kindergarten and 3 years of First Grade. I hope you enjoy taking a look around my blog! Megan Conway is a participant in the Amazon Services LLC Associates Program, an affiliate advertising program designed to provide a means for sites to earn advertising fees by advertising and linking to amazon.com.